Awesomenauts has fantastic potential, but is not quite there. Tweaks to the balancing and AI will make this one a star. Two cheery teams of three attempt to kill each other while slowly chipping away at the other team's turrets. If you aren't familiar with action-RTS games, Awesomenauts' simple side-scrolling approach is a fantastic place to pick up the basics. Smash the other team's defences to bits, then destroy their core so that you can win the game. The first thing you need to know is that it isn't safe to attack turrets without the help of your team's tiny robots. These droid helpers march across the map in pairs, and gain a major health boost when close to enemy turrets. Stand behind these bite-sized soldiers and you'll be able to attack turrets without getting hurt, but you'll usually have to protect the droids if you want them to get that far. Killing turrets, players, and enemy droids earns you solar – the currency you'll spend to buy upgrades for your character throughout the game. Gradually overpower the enemy team, and eventually you're more than likely to win. There are eight different characters to play as, but Ronimo tease that there'll be more to choose from soon. Initially you'll have to choose from the standard upgrades, but as you level up in the game each character will gain access to a choice of 24. You can only choose 12 upgrades to take into a game, and it's very unlikely you'll get the chance to max all of them out. Creating a tactical build order is an important part of winning the game, but in contrast with more complicated action-RTS games, roles in Awesomenauts are very fluid. Clunk is a tank and Voltar heals, but most other characters can serve more than one purpose. The variety of skills ensures it never feels like there's one 'correct' character build. None of them are so weak alone that they need support classes in order to survive, but teams of three friends who play together have got plenty of scope for making tactical builds. 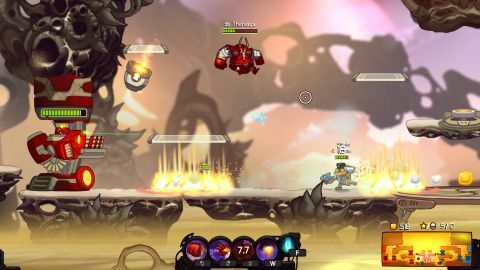 There's depth here for those who want it, but on the surface Awesomenauts is relatively easy to pick up and play. The inclusion of keyboard and mouse controls in the PC version have forced a few substantial changes to the game, though. The Xbox 360 version only supported eight-direction aiming, while mouse support upgrades this to 360 degrees. This massive advantage to ranged characters meant that a lot of the game needed to be rebalanced, and at this stage it doesn't feel like it's quite there. Playing with a controller still remains an option, but puts you at a big disadvantage: moving and aiming are mapped to one stick, which naturally takes away a lot of control. The other problem is the AI that replaces human players who drop out during a game. Erratic, dim, and yet often still hard to beat, the AI isn't much fun to play against. To compensate for their lack of tactics, these AI chumps seem to automatically gain solar at a rate that's almost impossible to keep up with – a cheap balancing trick that's overtly unfair. When you're playing against humans it isn't a problem, but this isn't reassuring for new players. It's a hell of a lot less complicated than other MOBA games, but many are likely to be turned off after a few practise games against the evil AI. Adding a new control scheme changes the game in unexpected ways, and Ronimo still has work to do if they want to stand out from the crowd. It's charming, addictive, and on the verge of being a genuine classic – a gateway drug and an ideal introduction to the burgeoning action-RTS genre. But as things stand, it isn't quite awesome.